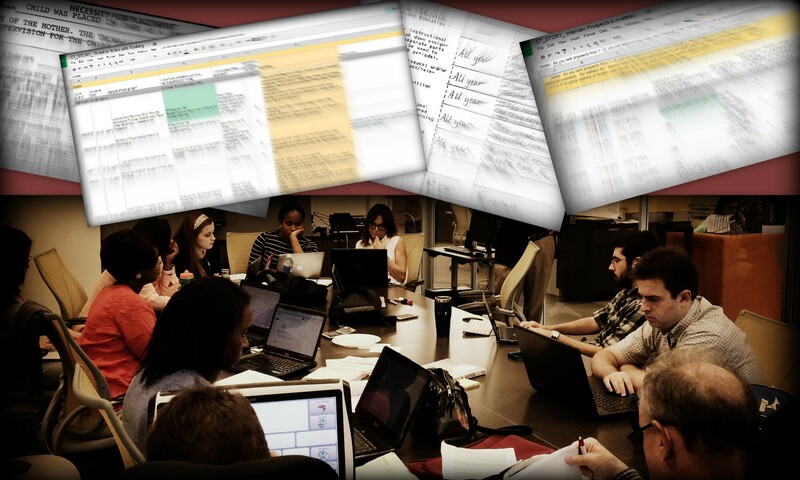 Picture this: Complete silence in a room full of 12 dedicated interns, working hard as they search through their documents to find the most significant parts of each one. With each important fact they uncover and add to the collaboration sheet on GoogleDocs, the closer they become to unraveling and effectively reporting the noteworthy story that could change the life of this particular youth, as well as the lives of many other youth across the country. If you pictured this, and felt it – with all of these imminent emotions of the substantial impact of this project welling up inside you – you may have successfully visualized and had a slight sense of the sixth JJIE VW group meeting that took place at 9AM today at the Center for Sustainable Journalism. Now – to have an idea of how we got to this moment of pure collaboration and document absorption, let’s take a moment to reflect on the meetings that had occurred just hours earlier. Before the group meeting today at 8AM, the Journalism group met to discuss the next steps regarding interviews, while the PR group met to discuss social media plans. While the Journalists were working on locating contact information of interview prospects, the PR group were working to make this project more prevalent in the community and beyond through the establishment of Facebook and Twitter accounts. In addition, the Virtual World group met yesterday, Thursday 9/22, to discuss the machinima for the CT story. After many hours of discussion on how to approach the story and how to produce the machinima, the group seems to have created a more precise outline of how they plan to display the story via virtual world. All in all, every single one of these tasks that each group is taking on are extremely important, and will ultimately work hand-in-hand to successfully expose this story to the world. 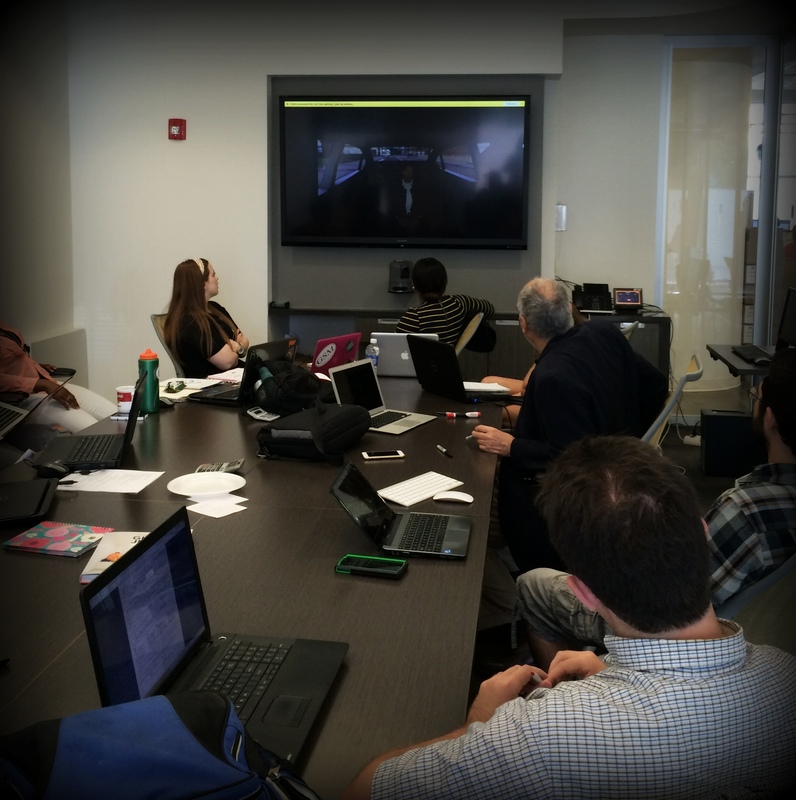 This brings us back to today’s meeting – where this hand-in-hand collaboration could be clearly observed. Today’s group meeting consisted of reverting back to each of the documents, and choosing the most significant quotes, moments, and facts from each. 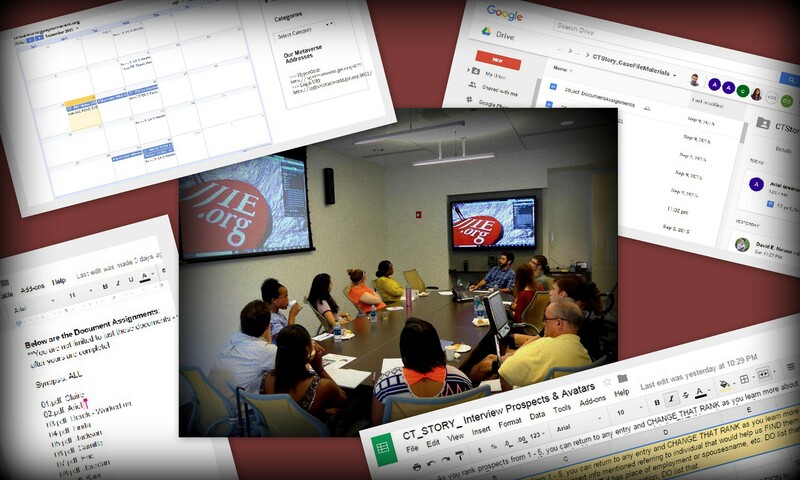 With each noteworthy finding, each intern took the time to enter the date, document #, description of event, names of people involved, quote, and any other relevant information into a neatly-created GoogleDoc spreadsheet, prepared by Gwenette. The intention of this spreadsheet is to make it easier for the machinimists to find the most important information and art clippings from the story to include in the machinima story. As GoogleDocs continues to be our medium for information collaboration, we all learn something new every day about the importance of organization and communication. Furthermore, every day, we all take one step closer to telling the story of this incarcerated youth, to making his voice heard, and possibly even magnifying the injustices of his case and in the Juvenile Justice System just enough to make a difference in this particular youth’s life, and more. 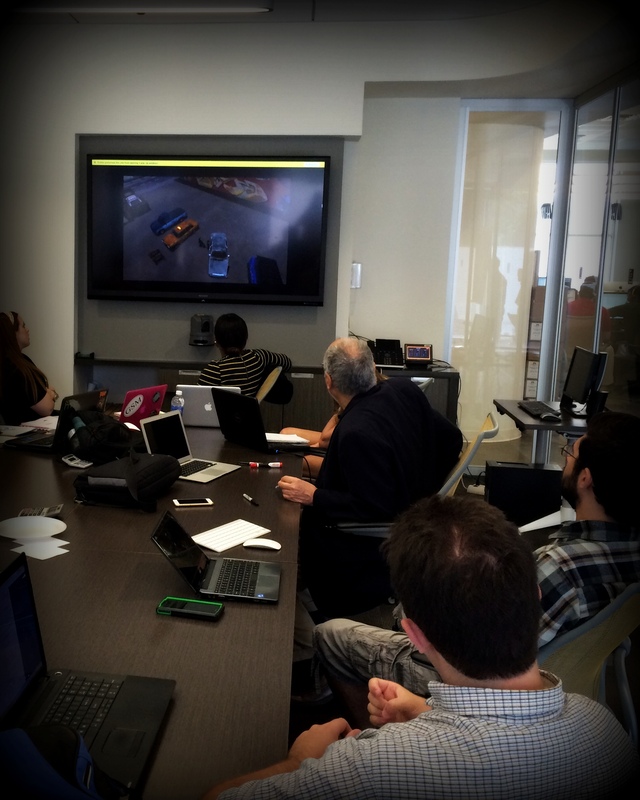 Finding, uploading and displaying imagery inworld is proving challenging for the project interns. 3D object creation is a new skill for all of them, but they are persistent and committed to learning inworld building skills. They are realizing how important it is to do things in order and pay careful attention to details – especially when manipulating a prim object’s shape, rotation and position. The completed assignments will become part of the emotionally evocative imagery used for the CT Story and Forgive poem machinima scenarios. 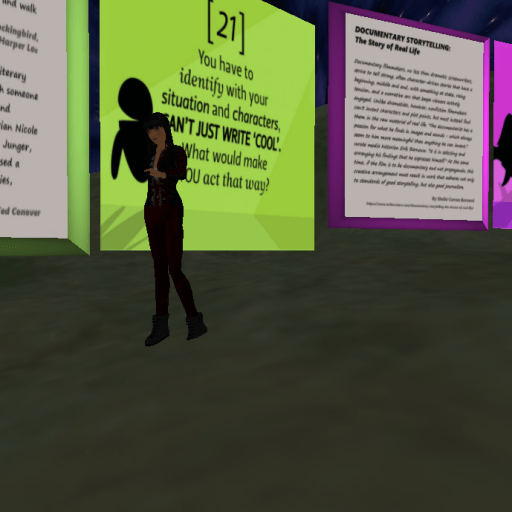 In the Storytelling Circle interns are exploring displays and slide shows about the classic principles of all storytelling, while learning guidelines for translating their stories into 3D immersive scenarios for journalism machinima documentaries. 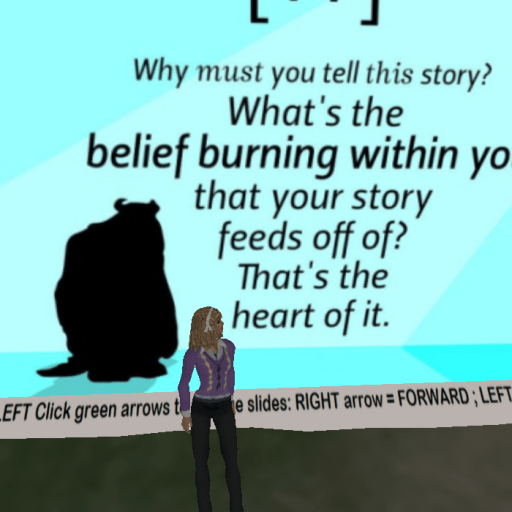 For one of their assignments, they took evening inworld snapshots of themselves in front of a Pixar Storytelling principle that is personally meaningful. 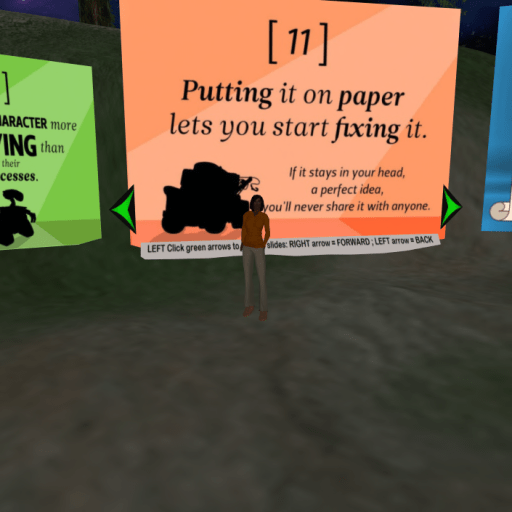 Then they dropped their own written comments about the principle in the Storytelling Creativity Basket inworld. The Journalism and PR groups got an early start Wednesday morning. 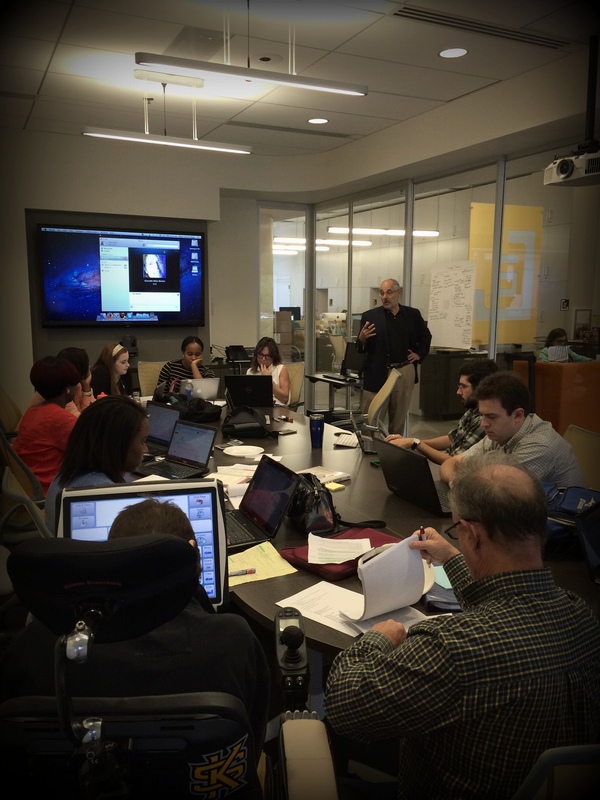 At 8 AM, both groups were at the Center for Sustainable Journalism ready to talk about our specific projects. While PR discussed their event/social media plans, the Journalism group prepared for the first interview with Steve Reba to be conducted in just a few hours. After talking within our separate groups until about 8:20 AM, we combined to discuss the CT Story case documents. As we explored the main aspects of the case, we decided that it was necessary to make a chronology of the youth’s life. Since a few of the journalists had already started a draft chronology on Google Docs, we continued using their document. As 9 AM rolled around, we continued to talk about the youth’s life, focusing on some of the major issues: his upbringing in and out of 30 foster care homes, his mental state, the crime, and the court hearing. Also, from the documents, we had been recording significant people in the youth’s life – from here, since we knew our next big step is interviewing, we wrote down all of these important contacts who could possible give us a better idea of the youth’s life and case. With a large piece of paper taped to the wall and pen in hand, Professor Witt divided up the paper into sections of people in the youth’s life: Family, Court/Legal, Co-defendants, Social Workers, Foster Care, Mental Health, Victims/Witnesses, etc. From here, the whole group joined in on reading out the names we had recorded from the documents. Soon, the paper was crowded with the names of people that we believe will be beneficial to contact for more insight on the case. 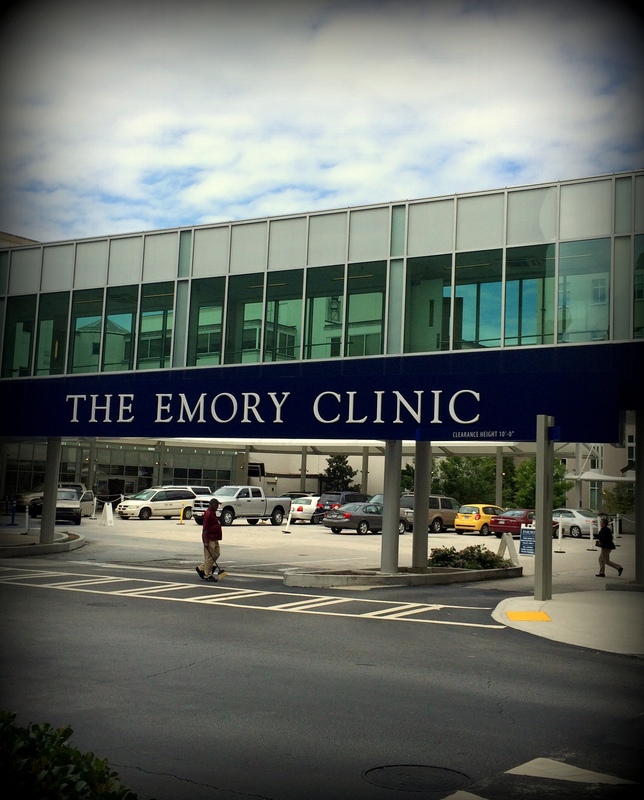 Halfway through the meeting, 4 members of the Journalism crew – Claire, Ann, Kevin, and Fred – had to leave for Emory Clinic to interview Steve Reba, the lawyer who is currently working to bring the youth’s case back into court for another hearing. The remainder of the meeting was spent discussing ideas for the machinima storybaord. Everyone was eager to contribute – even the journalists listened on speaker phone as they drove to interview Steve. After our discussion, everyone had a better idea of what the finished machinima might look like. To get our minds in “inworld” mode, the Virtual World “The Kid, The Cop, The Punch” Machinima group showed everyone what they had been working on: draft machinima scenes from an incident that occurred in Chicago during the 1990’s. With this awesome presentation as reference, everyone at the table had a better vision of how the machinima for our story could develop. Each team member was thinking about how we could best showcase the youth’s story in he virtual world platform. We intend to catch the attention of a wide audience. We know how crucial this story presentation could be to the future of this youth’s life. As for the interview with Steve Reba – it went great. Steve has been working on this case for the past 5 years. He’s extremely knowledgeable about every aspect of the case and the youth’s life. He was more than willing to answer and expand upon all of our questions. During the interview Steve agreed any extra attention brought to this case could be helpful to future appeals. Shining light on the injustices of this case in a virtual world machinima might just be how this youth gets another chance in court. Next step: Set up interviews with contacts from our interview prospects outline and hopefully, with the help of Steve, an interview with the youth himself. Reading through the CT Story documents, I believe that we all have begun to realize just how crucial our coverage of this case is. Not only is it significant for this particular project’s goal of giving a voice to the marginalized youth in the Juvenile Justice System, but it is also extremely important for this particular youth who may have been neglected a fair deal in his original trial. It’s true. If we commit ourselves to “doing a great virtual world rendition, doing a great journalism story, and doing great public relations, all will elevate the project to get the attention it deserves” – Leonard Witt. For this JJIE Virtual World machinima project, good is not good enough. Despite our countless other obligations, we must realize the significance of this case to this boy’s life, and to the numerous other youth who could stumble down the same path. If we want to make a difference and really bring justice to this case and many others like it, we must commit ourselves now. For the next twelve weeks, we must be willing to push past our limits to devote our time to a cause that is bigger than any other personal obligation. If we truly dedicate ourselves to this cause, then these next twelve weeks could be some of the most rewarding ones of our lives. It’s time to make a difference. True commitment begins now. The beginning of gathering graphics for machinima special effects & memory flashbacks. As we wrap up editing and polishing the Chicago neighborhood machinima, the interns begin exploring the internet for Creative Commons licensed CC0 and CC-By images. They are searching for photographs and textures that portray and evoke emotions. The project’s two final machinima – one a real journalism documentary we call “The CT Story” and one a personal poem by a young person struggling with their emotions – will both use graphics and inworld special effects to create immersive, visual experiences to tell their stories. Today’s group meeting started out with a much-needed talk about the organization of the project’s activities and documents. Gwenette led the first thirty minutes as we all took a step back to talk about the valuable information on this very JJIE Virtual World site, as well as to review the strict schedule. We discussed how to post and organize blogs, how to locate and read the calendar on the site (located under Project Info tab), and what needed to be done so we can meet our deadlines. A major eye-opener for many was the September 30th Machinima Content Deadline. This is very important to note, as it means that the Journalists must have relayed all of the necessary information on the CT story that will be going into the machinima. Although we do have an “emergency info add” deadline for any missing pieces that must be in the virtual world story, the strict deadline is September 30th. The earliest event, coming up on Wednesday, October 7, is a live, inworld music concert produced by the popular Hypergrid Safari Tours group. They run weekly hypergrid tours across the Opensim Metaverse for crowds of up to 20+ die-hard hypergrid explorers and music fans. We will be hosting their October 7, Noon to 1pmET, music concert on our very own JJIE Virtual World Welcome Workshop region’s Beach Music Stage. In addition, that same Wednesday morning, Nina Camplin, an artist and machinimist from England, will be our guest speaker during our group meeting. Our Wednesday, October 21, classs speaker, Chantal Harvey, a professional Dutch television producer, animator, machinimist and machinima festival producer from Amsterdam, will be sharing her creative techniques and virtual world machinima tips with our team. 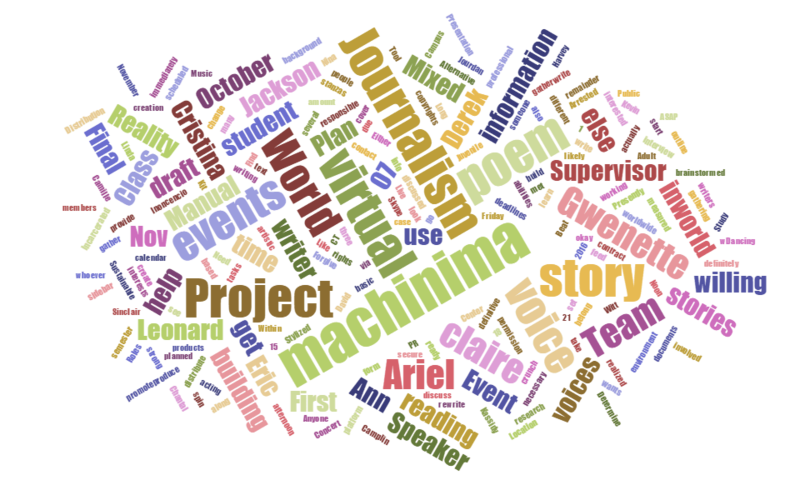 Looking ahead to our final project showcase – it will be held in the Media Lab of the Social Science Building at Kennesaw State University, December 2, 2015 from 4:30-7:30. All KSU staff and students are welcome to attend. After PR talk, we discussed our source materials for next machinima story writing and scenario creation: the CT Story documents received from Steve Reba. We decided that everyone should be familiar with the case in order to commit themselves to the project. Claire Bohrer, the Journalist Producer, divided up the documents amongst the twelve interns to read through and give a detailed summary of each assigned file. Via GoogleDrive, each team member has designated pdf files to read and correlating templates for notes in which to record his or her findings. The deadline for the completed summaries is Monday, September 14, 2015 at 5:00PM. After all the document summaries are submitted, every group member must go back and read through the every summary (or full pdf files) to become familiar with all aspects of the case. During our group meeting on Wednesday, September 16, we plan to discuss the key points of each document. Along with the summaries, we will be recording interview/avatar prospects, significant locations, and important event dates. All of this information is relevant to both the Journalist Group, who is writing the story, and the Virtual World group, who will be building the machinima scenario. When it comes to inworld assignments: Gwenette has prepared our Week 03 & 04 assignment, involving researching Creative Commons licensed, emotionally evocative visuals, then uploading, framing and displaying them inworld. The assignment is due on Tuesday, September 15. 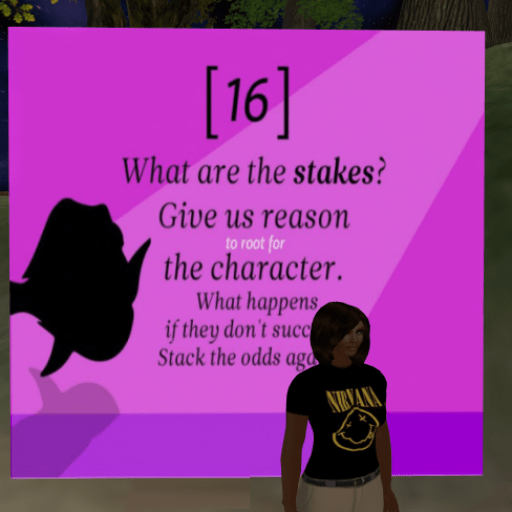 These skills will be important during our creation of the graphics and inworld special effects for both the CT Story and the “Forgive” poem machinimas. At the end of the meeting, we all split up into our groups to discuss and assign tour specific tasks. Although we may be in three separate task groups, there is no doubt that we will all be working collaboratively to make this project a success. Just a heads up: Here is a screen capture of all our interns’ names showing you where to find the links to their individual blogs. 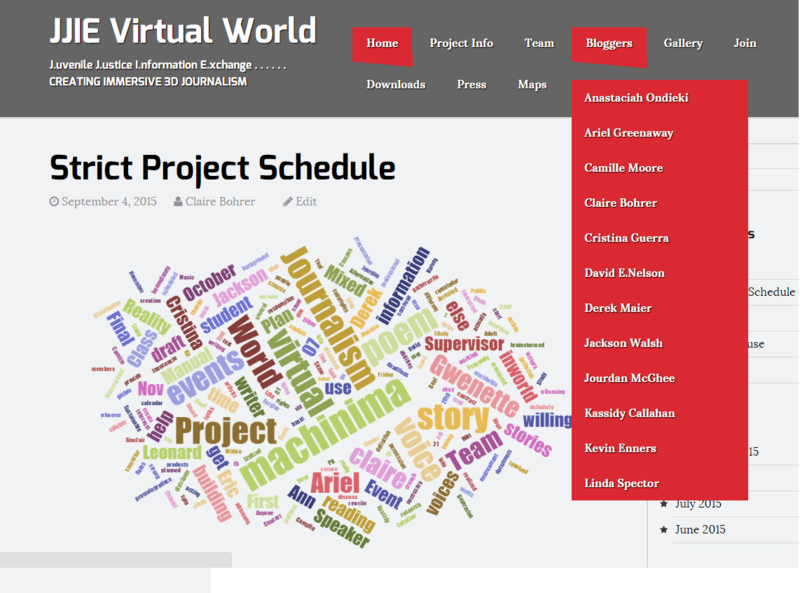 Note we have changed the “Blogs” tab and category to read “Bloggers”. On that top tier tab page you will find ALL the blog posts by our interns in chronological order. We have several categories bloggers can check to help showcase each post’s contents. For example, every intern post always checks off the categories of their own Name and Bloggers, and any other subject category that describes the post, like OpenSim or Avatars or Machinima. If you want to read about a specific topic, look to the sidebar. On every page there is a dropdown menu with all the categories with the number of related posts. Click any category title and you will find all the posts about that topic from both our interns and our Front Page writers. Friday afternoon at the Center for Sustainable Journalism, a few team members, along with Leonard and Gwenette, met up (via Skype for Gwenette) to discuss a necessary calendar of deadlines for the project. As we discussed the stories we planned to cover and measured out the amount of time we actually had to gather/write the stories, create the machinima, and to promote/produce the scheduled events, we realized that we were definitely in a time crunch. So, we brainstormed a plan for the remainder of the semester. Roles are not definitive, and will likely change as we learn who is willing to take on which tasks, based on abilities and interests. Claire & Ann will secure that – get in writing that it is okay to set the poem in a virtual world environment and that we have worldwide rights to distribute that in any form and on any platform, the copyrights to the poem and any other use of the poem belong to the writer. We can provide them a contract. Ariel & Claire: Find a voice: First, see if the writer is willing to voice it, if not, we will have to do the voice for it. Either a student in the project, an acting student or someone with a strong professional voice. Alternative is to use several voices reading different stanzas, so we will be gathering many voices reading the poem. Team only responsible for suggestions and comments on draft versions. Final version will be distributed in early 2016. During the summer semester Eric, Derek, and Gwenette were working to develop a complete virtual world region (about 16 acres of land) with a neighborhood from Chicago circa 1990’s and produce a machinima of a young boy’s altercation with police. It is looking very impressive. Derek, Eric, and I met last week to discuss what my role would be in the early machinima production stages of the project this fall. We decided that editing what they have recorded thus far would be a great fit. We are looking to create a “prototype” of what the machinima stories we tell during our semester internship could potentially look like. I spent a couple of hours using video editing software already installed on my computer, but I have not used it much. Still, I was able to piece together a three-minute video that showcases the Chicago neighborhood. The challenges I encountered involved creating smooth transitions, dealing with flickering objects in the shots, and determining the best sequence for the footage. We still have some more shooting and editing to do, but our machinima is looking great!